Swimming’s a great way to have fun and get healthy, whatever your age of level of ability. In our 5 lane, 25m swimming pool we offer a variety of activities including swimming lessons, early morning swim, Aqua Aerobics, Swim Fit and lane swimming. The changing rooms feature group changing, individual cubicles, accessible changing, baby changing and enclosed showers. Click here to find out more about the swimming sessions we offer or alternatively you can view the timetable by clicking on the link below. Our spacious health and fitness suite is air conditioned and we have an extensive range of resistance machines; you will find a machine to work every major muscle group in the body. We also have a large free weights area which has been carefully designed to give you the tools you need to achieve your workout goals. If you haven’t used free weights before but would like to try, our Fitness Team are always on hand to help give advice and assistance. Build up your strength and endurance in our state of the art Functional Fitness and Strength zone. It’s the largest of its kind in Cardiff since the centre re-opened in August 2016 after its £6 million renovation. If you haven’t used functional equipment before but would like to try, our Fitness Team are always on hand to help give advice and assistance. Find the perfect way to keep active in our group fitness classes such as Box Fit, Group Fight, Zumba and Total Body Conditioning. Click here to find out more about the fitness classes we offer or alternatively you can view the timetable by clicking on the link below. Pedal your way fit and burn approximately 560 calories per hour in our air conditioned Group Cycling Room. The centre features 22 brand new TechnoGym bikes, the same bikes as used by Olympians. These bikes have accurate digital monitoring detailing RPM, power and resistance levels. Stay fit with racquet sports; it’s a great way to improve your reflexes, hand to eye coordination and overall fitness levels. This centre has two new and popular squash courts which are available to use as a member or pay as you go. The sports hall is a multi-sport arena featuring three badminton courts, a five a side football pitch and one volleyball court. Home to many activities including junior football and badminton, the sports hall is also available to hire. 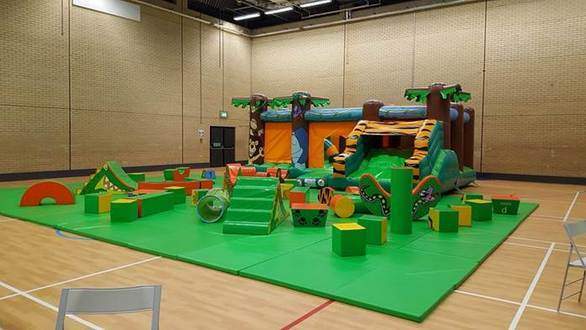 Our soft play sessions for under 5’s has brand new equipment and offers an affordable and safe environment for your children to play and make friends. Soft play parties are also available with food provided on request. A large, air conditioned meeting room is available for booking. Accommodating up to 25 people, the room features a Smart Board and flip chart. Refreshments are available on request.